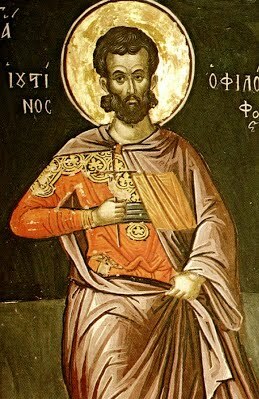 June 1 - Saint Justin Martyr – Memorial - My Catholic Life! On one of his first missionary journeys, St. Paul found himself in Syria. He was at a crossroads and needed to decide where he would travel to preach the Gospel. Do I head east and bring the Gospel to the eastern gentiles of Mesopotamia, Persia, India, and China? Or do I travel west, to the Greeks, Romans, Franks, and the people on the rim of the Roman Sea (the Mediterranean)? The Acts of the Apostles relates the mystical event that happened next: “During the night Paul had a vision: there stood a man of Macedonia pleading with him and saying, ‘Come over to Macedonia and help us.’ When he had seen the vision, we immediately tried to cross over to Macedonia, being convinced that God had called us to proclaim the good news to them.” (Acts 16: 9-10.) Macedonia is in Greece. So St. Paul went West. The rest is history. In the person of St. Paul, the Church herself turned toward Greece and her philosophical tradition. It was the plan of God that His Church would decisively encounter philosophical truth, not cultural myth and custom, as its dialogue partner. This long intellectual process of melding philosophical truth with theological revelation transformed early, Jewish based Christianity into something new—the powerful synthesis of theology, philosophy, spirituality, and structure known as Catholicism. Today’s saint was a philosopher in the Greek tradition, born around 100 A.D. Saint Justin wrapped himself in the white, toga style cloak of a Greek philosopher even after his conversion. He is the most well-known apologist of the second century, the only true Christian thinker known between the time of St. John the Evangelist until Origin in the late third century. He mercilessly criticized the intellectual dead end of ancient paganism which he had grown up with, seeing it as not merely neutral, but as an obstacle to discovering the truth. Justin loved the idea that Christ the Logos was the same in substance but different in number from the Father. Theological truth expressed in the concepts of Greek philosophy was very satisfying to him because it was very true. Justin also provided some of the very first words on the Holy Eucharist outside of the New Testament itself: “And this food is called among us the Eucharist … we (have) been taught that the food which is blessed by the prayer of His word, and from which our blood and flesh by transmutation are nourished, is the flesh and blood of that Jesus who was made flesh.” What a clear and remarkable testament to Christianity’s early belief in the Eucharist! Justin moved to Rome to teach philosophy and spent decades there writing and interacting with the higher echelons of Roman society. But even a thoughtful intellectual was not immune from persecution for being a Christian. Sometime between 162 and 168 A.D., Justin and six companions were called to answer for their beliefs before the Prefect of Rome. The record of the trial has been preserved and shows the Prefect demanding that Justin sacrifice to the gods of Rome. Justin and his friends refuse and are threatened with torture and death. They respond: “Do as you wish; for we are Christians, and we do not sacrifice to idols.” What bravado! They sternly refused to be idolaters. They were duly led away, scourged, and beheaded. Justin chose, as the Church chose, the God of the philosophers over the false gods of paganism. This was a choice for truth over illusion. As Tertullian would later write: “Christ has said that he is truth, not fashion” (De Virgin. Vel. 1, 1). The Christian God is both Father and the Prime Mover; the God of Jesus Christ and the Almighty; the God of Abraham, Isaac, and Jacob; and I am Who am. We take this complex understanding of God for granted today. But the labor of early Christians like St. Justin Martyr dug the deep intellectual foundations upon which now our stand sound doctrine and simple piety. It takes very smart people to make simple points. St. Justin, you surrendered your life rather than worship an idol. Your consistency in refusing to abjure your faith is an example to all intellectuals and teachers that the deepest truths are not found only on a page but must also be lived in real life. Reflection.—We have received the gift of faith with little labor of our own. Let us learn how to value it from those who reached it after long search, and lived in the misery of a world which did not know God. Let us fear, as St. Justin did, the account we shall have to render for the gift of God.